Reconnect with nature, when you spend the day at Callaway Gardens in Pine Mountain. Purchase your admission in advance and visit anytime between 9am and 6pm. With over 10 miles of trails for biking and hiking, the gardens are a great place for families, couples, or individuals looking to relax and enjoy Georgian landscapes. Visit the Butterfly Center, Azael Bowl, Memorial Chapel, and more, to learn about local wildlife and culture. Includes access to all of our facilities including the Virginia Hand Callaway Discovery Center, Cecil B. Day Butterfly Center, Ida Cason Callaway Memorial Chapel, Callaway Brothers Azalea Bowl, and our many walking and biking trails. 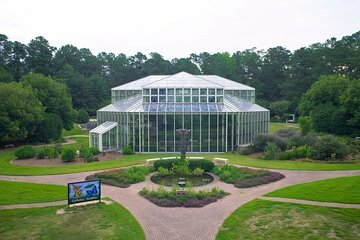 The main entrance to visit Callaway Gardens is located at 17617 U.S. Highway 27 Pine Mountain, GA 31822. The Gardens entrance is located just South of 17800 US Hwy 27 Pine Mountain GA 31822. Attractions and indoor facilities are open 9am to 6pm daily. Outdoor gardens and trails are open until dusk.